This recipe here is just one of many HOME RUNS I have experienced with Blue Apron! If you would like to try a week of Blue Apron for FREE!! Email me with your full name, email and zip code and I will gift up to FIVE people with a free box (once I have confirmed BA is available in your zip!). Prepare the ingredients: While the rice cooks, wash and dry the fresh produce. Remove the fish from the refrigerator to bring to room temperature. Cut off and discard the rind and white pith of the grapefruit; medium dice the grapefruit. Peel and thinly slice the onion. Pit, peel and medium dice the avocado; toss with a splash of the vinegar to prevent browning. Pickle the onion: While the rice continues to cook, heat a medium pan (nonstick, if you have one) on medium until hot. Add the onion, sugar, remaining vinegar, a big pinch of salt and ¼ cup of water. Cook, stirring occasionally, 1 to 2 minutes, or until the liquid has slightly reduced in volume. Transfer to a heatproof bowl and set aside. Rinse and wipe out the pan. Cook the cod: Once the rice has cooked for about 15 minutes, pat the cod fillets dry with paper towels; season on both sides with salt, pepper, chili, cumin and cocoa powder (mix all powders on a plate and gently pat the cod in the mix on both sides or just one for a less spicy version). In the same pan used to pickle the onion, heat 2 teaspoons of olive oil on medium-high until hot. Add the seasoned cod fillets and cook 3 to 4 minutes per side, or until browned and cooked through. Remove from heat and set aside in a warm place. Make the red rice salad: To the bowl of cooked rice, add the avocado, grapefruit, pickled onion(draining before adding). Drizzle with olive oil and toss to thoroughly coat; season with salt and pepper to taste. 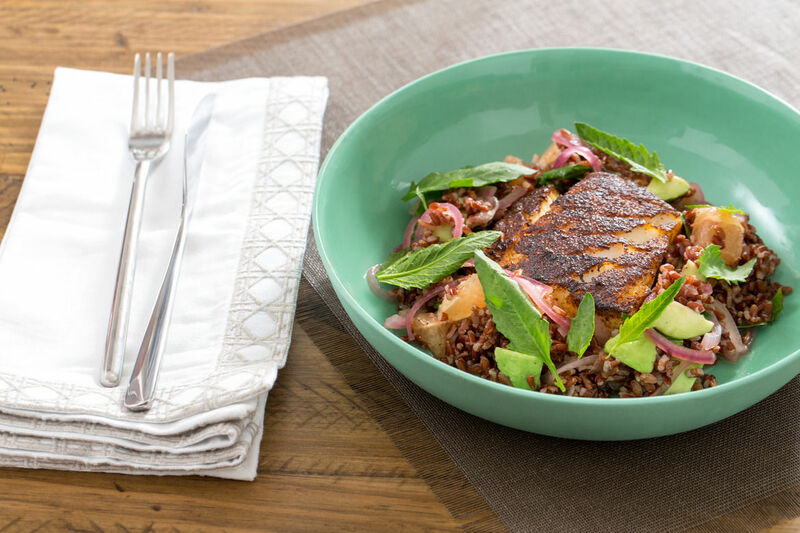 Plate your dish: Divide the red rice salad and cooked cod between 2 dishes. Enjoy! I am back in the gym now but have continued to opt for having BA boxes delivered almost every week to keep meals interesting. Whereas before I would cook for someone else, I am now using these boxes as work meals substitutes. You know you get bored of the same take out time and time again! Consider this your cure!